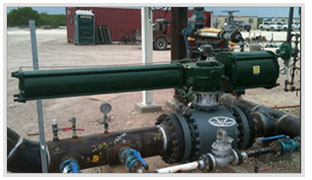 UniTorq Scotch Yoke actuators provide rugged reliability in the field. Designed for use over a wide range of pressures and temperatures, our Scotch Yoke actuators are available in a number of different sizes, cylinder diameters and double acting or spring return configurations. Torque sizes up to 1,000,000 in-lbs. are available. The rugged construction of the Scotch Yoke includes two-piece cast housing for protection and stability of internal parts. High-grade alloy materials are used in all motion transfer components for precise and smooth operation at the full rated torque output. They are also designed to withstand vibrations that occur at most plant environments and are seismically qualified for nuclear applications. A full line of accessories are also available including position indicating switches, solenoids and positioners. Contact us for more information on our product line of Scotch Yoke Actuators.